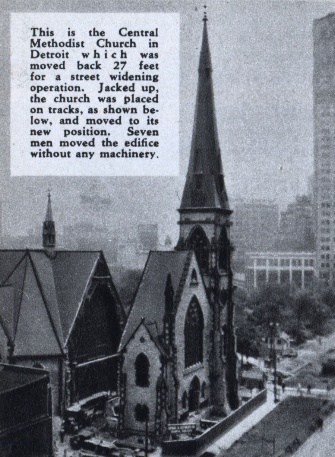 ONE of the most unusual engineering feats in recent years was the moving of a 4,000,000-pound Detroit church steeple to make way for a wider street. Check out the rest of the details at blog.modernmechanix.com. Interesting story but it left a lot out. 4 million pounds was jacked up [?] and then moved by seven men, without machinery [?]. It sounds as though the seven of them just pushed it back into place. I'm trying to imagine skids and wheels constructed to hold 4 million pounds.